Throughout Berlin there are perhaps an overabundance of cafes. From bakeries with a couple of seats, to kiosks with a coffee machine, it seems everyone is calling themselves a café these days. At My Destination Berlin, we take our coffee, cake and snacks seriously. Only the best of Berlin’s cafes make it onto our list. 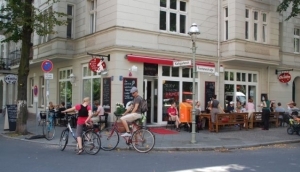 Our ‘Café’ listing can help you find your fix of good coffee, tea, cakes, and snacks in Berlin. From cosy cafes with vintage flair, to more modern design; open for breakfast, lunch and cake.